The project is located on a corner lot, on a walk street, in Venice, California. Venice is a beachside city in Los Angeles with a diverse community and a long history as a home for artists and alternative culture. Tony Alva and Stacy Peralta of "DogTown" fame, Jim Morrison of the Doors, and artists Robert Irwin and Frank Gehry used Venice as a laboratory early in their careers. 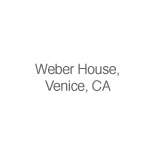 The Eames' original studio and factory is located in Venice. In Venice, larger architecturally significant projects often stand side to side with smaller, modest craftsman-style beach bungalows constructed mostly in the 1920's. The walk streets are unique because the lots front onto a common, five-foot wide, pedestrian only garden path. Automotive access is from a service alley at the rear of the property. I'm told this was done to save the cost of paving the east-west streets. Because the houses front to a shared garden path there is a lot of "hanging out" on front decks and patios, and maybe even a heightened sense of community. The site is a corner lot. The lot is flat and rectangular, and modestly sized at 3,800 square feet. The front of the lot faces to the northwest. The existing abutting lot is developed with a two-story home. The corner is a point of transition. In this case the bucolic walk-street shares the corner with nosier Oakwood Ave. Southern California has an extremely mild climate. Because of this, yards are used as extended living rooms to entertain guests. The project was designed following the footprint of the previous structure, to maintain as much rear yard as possible. The mild climate allowed us to design the home to include large, custom, commercial windows, ideal to cool the house in the summer. Prevailing winds come from the west (ocean) in the afternoon. The neighborhood is zoned for single-family homes and duplexes. Required side yards vary from 3 to 5 feet. The height limit is 25-feet. There is no limitation to the square footage of a project other than the limitations of the site. There is currently no design review process for projects that meet zoning requirements. The clients are a married couple with a one-year old child. Both husband and wife work in the film industry and enjoy entertaining. They wanted their home to be modern, but not cold. They had environmental concerns and wanted their design to be earth friendly. The home includes a master bedroom suite, a child's bedroom, a guest bedroom, 2 1/2 baths, kitchen, dining room and living room. The garage was converted to a home office. This project is built in the tradition of Southern California modern architecture. It emphasizes efficiency, an open plan, indoor/outdoor living, and the use of natural, locally produced materials for finishes. Floors, stairs, and built-ins are built of wood to add warmth to the living spaces. Living spaces are separated by built-in shelving rather than solid walls to keep a feeling of openness between rooms. Indoor spaces expand to adjacent outdoor spaces via decks, balconies and patios. The floor levels and ceiling heights vary to maximize the perception of spaciousness. Because of the large openings and cantilevers, the building is designed with a hybrid structural system including tube steel set into deepened concrete footings. Wood and plywood shear walls are used to counteract potential earthquake generated lateral loads. Sustainable features include: passive solar heating, FSB certified lumber, low-e laminated glass, formaldehyde-free insulation, natural and mechanical ventilation, and chalk-based nontoxic paints. Louvers are used on the east, south, and west elevations to minimize the amount of cooling required in the summer. The garden is primarily California Native and drought resistant plants, and includes a drip irrigation system. The project took six months to permit and twelve months to build. This project cost 150 dollars per square foot. The project size is 2000 square feet. The project is a 3 bedroom, 2 1/2 bath, single family dwelling with a detached two-car garage.